Cellulite is a very common condition. It is seen in almost all adult women in various degrees and can therefore be considered a normal variation of the appearance of the skin. There are many myths and misunderstandings about the causes and treatment of cellulite. The condition remains difficult to treat with few studies demonstrating impressive, long-standing results despite the “commercial hype” of advertised products. Cellulite is not really a “disease” and is not related to any internal medical conditions. 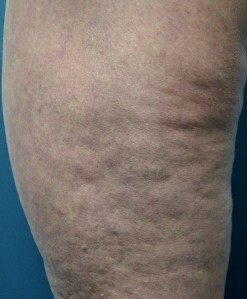 Cellulite does not usually cause any worrisome symptoms or problems other than the undesired appearance of the skin. Localised build-up of fluid in the skin from the microcirculation and lymphatics. Cellulite is seen in nearly all women but it rarely occurs in men. It does not usually appear until puberty or later in life. 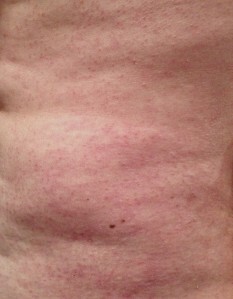 The female hormone oestrogen is thought to contribute to the distribution of fat that causes the appearance of cellulite. Other contributing factors include family history, genetics, and racial factors (it is less common in Asians). Cellulite typically presents as dimpled, uneven and slightly lumpy skin over the buttocks, thighs and other areas. Women are most commonly affected due to the differences in deep skin structure between the sexes. Cellulite can be diagnosed clinically without the need for further testing. Weight gain may accentuate the appearance of cellulite. In general, there is no single highly effective cure for cellulite. Most advertised “treatments” that promise to cure cellulite do not live up to their hype. Since cellulite is not strictly related to excess body fat, losing weight through dieting and/or exercise may not always resolve the problem. Many people with cellulite are within normal weight range, however the condition is certainly more pronounced in those carrying excess weight. Most creams that promise to remove cellulite do not deliver on their claimed effects. Many natural botanical products claim to reduce the appearance of cellulite but there is limited evidence that they have any effect. Creams containing caffeine, vitamin A derivatives (Retinoids), and aminophylline are well advertised. Again, there is very weak evidence regarding the success of these creams and most don’t cause a great deal of change in the cellulite, even with regular long-term use. Similarly, various dietary supplements such as gingko balboa, soy lecithin, bioflavinoids, evening primrose oil etc have been promoted, without solid clinical studies, to be effective through anti-oxidant effects, improving micro-circulation and fat metabolism. Physical treatments such as massage and various “hi-tech” light and laser devices with pneumatic suction can, in some cases, reduce the appearance of cellulite to some degree. 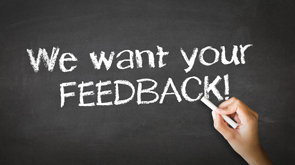 Ultrasonic, acoustic wave and radiofrequency devices can also improve the appearance of cellulite. However, these anti-cellulite devices require multiple treatment sessions that can be expensive, and long-lasting results are not guaranteed. Surgical techniques such as liposuction and subcision can be considered but these procedures are not always successful and, in some cases, may make the condition worse.